*For bi- coloured cores the first colour is the base colour. 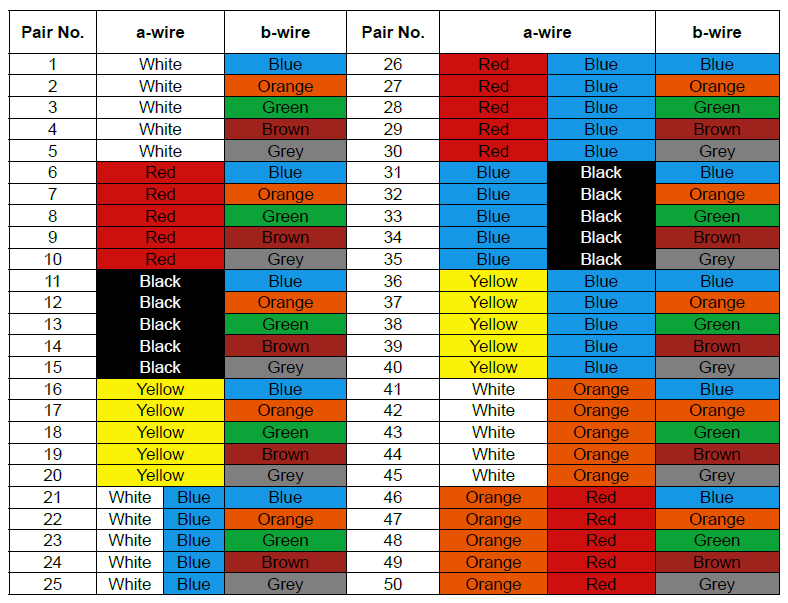 They can also be identified by each pair in the cable having one black and one blue core. Each core shall also be identified through marking by inscription of a number on the core’s insulation in accordance with BS EN 50334. Both cores in a pair shall be marked with the same number. They can also be identified by each pair in the cable having one black and one blue core.Each pair shall be covered in a numbered polyester film. The numbering shall be such that each pair is distinguishable from any other pairs in the cable. The distance between each number shall not be greater than 50 mm. All cores shall be yellow and numbered 1 to 40 with both printed numbers and written word, in black, e.g. core 10 would be yellow and identified by number “10, TEN” in black. All cores shall be black and numbered 1 to 40 with both printed numbers and written word, in a contrasting colour, e.g. core 50 would be coloured black and identified by number “10, TEN” in yellow or white.